2015 is now underway and all eyes are searching the horizon for signals foretelling this yearâ€™s real estate trends.Â Will 2015 differ from 2014, or will history repeat itself?Â Trends by their nature involve time.Â So attempting in February to predict the market of 2015 is a dicey proposition.Â But we certainly have a few early clues. â€œThere have been a total of 4,353 new listings added since the start of the year (across all areas & types) which is 9.1% below 2014 and 1.3% below 2013. This is a low number and suggests that supply trends are weak despite the seasonal increase in active listings that we see in January every year. In fact it is a new record low for the 15 year period 2001-2015. 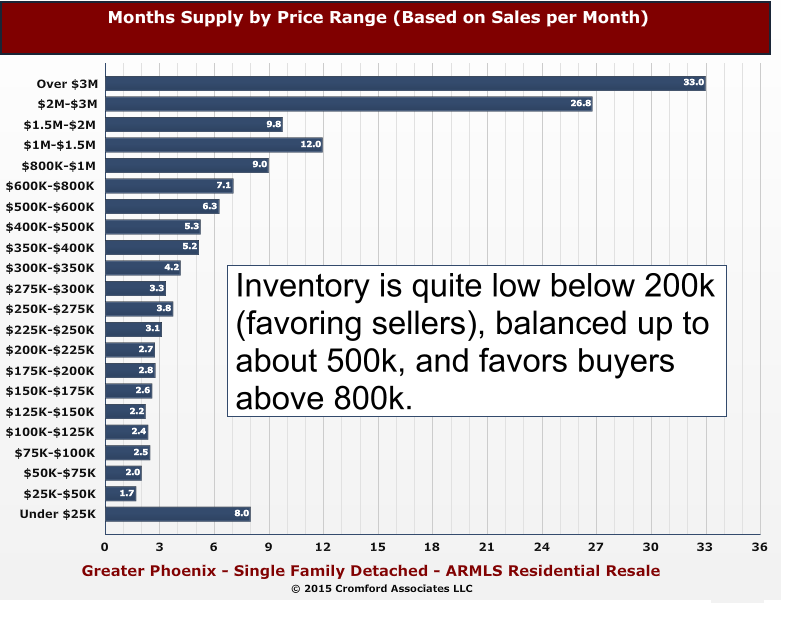 New supply is particularly weak at the bottom of the market under $200,000 while it is quite strong over $800,000. Sellers of entry level homes are going to have less competition while sellers at the top end are going to have more competition compared with last year. As referenced, the luxury market is a market unto itself.Â It rarely acts in unison with the market as a whole.Â For instance, supply remains heavy in the luxury market, despite December 2014 being a huge month for luxury homes sales.Â December 2014 was the best December for luxury sales since 2006 with 109 closed transactions across Greater Phoenix for homes priced at $1 million and above. But make no mistake; luxury supply still well outpaces demand. Thankfully, the buyer mix has shifted away from investors and back to an owner occupied dominant market. We are of the mind that this is a good thing â€“ as we have mentioned in previous articles. Abnormally large investor activity is a sign of a very unhealthy market â€“ such as was the case in the over-exuberant market of 2005 or the walking dead market of 2009.Â In 2015, we are back at a market where the buyer is the end user.Â Recent changes to lending are now arriving to stimulate the market â€“ particularly the first time buyer market (are you listening millennials?) President Obamaâ€™s visit to Russellâ€™s alma mater (Central High) was perhaps more news worthy than noteworthy â€“ but he did announce the changes to FHAâ€˜s insurance program that will assist a small segment of the population.Â The drop in the cost of FHA insurance gives buyers in this price range an approximately additional $20,000 of buying power.Â Add to that Fannie Mae and Freddie Macâ€™s new lending programs with 3% down â€“ helping homeowners who didnâ€™t have the 5% down typically required and who may have exceeded FHAâ€™s loan limits (currently $271,050 for FHA, $417,000 for Fannie/Freddie conventional loans). Given our low supply and our slightly stronger demand, our market has drifted from a slight buyerâ€™s market to a balanced market.Â If this trend continues, we could very quickly see sellerâ€™s regaining the upper hand in negotiations. In fact, should demand increase in any significant way, it will rapidly overtake our supply. It will take a bit of time for the constraint to result in higher pricing â€“ price being a trailing indicator- but it will show up.Â Â If this comes to pass, Buyers may be wishing they bought in 2014.Â What is good for the duck hunter is rarely good for the duck. Happy 2015! However tardy, we had to add our best wishes for a wonderful new year.Â 2015 has been a year long awaited by the real estate industry â€“ as many speculated in the last few years that real estate would boom in 2015.Â So will 2015 in fact be the gangbuster year dreamed of?Â Given the tumultuous past we have navigated, we are loathe to make predictions.Â Â Â As Yogi Berra so famously stated â€œThe future ainâ€™t what it used to be.â€œ But, we are seeing early signs of improvement in demand. As we mentioned in past articles, the lack of demand in our market (and frankly across the country) has been the story of 2014.Â Oddly enough, the saving grace was that supply was also constrained at the same time.Â Buyers didnâ€™t (or couldnâ€™t) buy and sellers were scarce and did not put their homes on the market at expected levels. 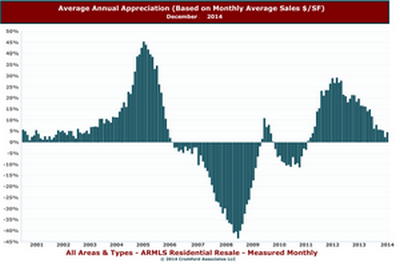 So 2014 became a low volume market â€“ meaning lower than â€œnormalâ€ levels of home changing occurred. The signal we have been watching for is improvement in demand.Â Apparently Santa was listening because in December the first signs of improvement in demand began to trickle in.Â To quote our favorite real estate guru Michael Orr â€œWhen comparing 2013 and 2014 we can see that 2014 has been weaker than 2013 for most of the year but has recently improved. The difference is not great but I find it convincing evidence that a slow improvement has started.â€Â Locally, the first few weeks of December showed the highest number for home sales for the same period since 2006.Â Â Trends by their nature must extend past a few weeks but these are the early signals (we hope) of what is to come. Another possible factor behind demand picking up is the lack of rental supply.Â Finding homes to rent under $1000 monthly has become truly a challenge and at some point this lack of rentals will cause either more low end apartments to be built or cause renters to become buyers.Â Could the recent improvement in demand be the first signs of renters becoming buyers?Â We certainly hope so. Lending seems to be the primary culprit behind 2014â€™s lack of demand.Â Add to that an economy still struggling to right itself, and the debt load carried by most consumers, and itâ€™s not too hard to see why demand has been constrained.Â We feel confident that it is a matter of time until the lending community responds to the lack of programs for buyers.Â In fact, we are starting to see the first signs of the lending issues being addressed.Â Fannie Mae and Freddie Mac announced a program for first time home buyers that allows for a 3% down payment and lends up to $417,000 (currently FHA is 3.5% down and only lends up to $271,050 in the valley).Â Add in the remarkably low interest rates (currently at less than half the historic average of 8.5%) and lending certainly is poised for improvement.Â At the end of the day, lenders must lend to make money. A possible additional bonus to the local market is the Super Bowl.Â Whether imagined or real as a real estate boon, approximately 90,000 additional people are heading to Phoenix.Â There can be little downside for our market to have that many valley visitors. If demand truly begins to pick up steam, we could see 2015 convert back to a seller market. Of course, the one lesson the last ten years has taught us is nothing is for certain. No matter what happens, we will strive to keep you aware of the ever changing market. Hereâ€™s to a great 2015! The last decade has seen some of the most volatile real estate profits and losses that most people will see in their lifetimes.Â The sad thing is what this has done to the average consumerâ€™s perception of appreciation.Â If you have one year (as we did) with 47% increase in values â€“ then the historical range of 2-5% appreciationÂ looks pretty pathetic.Â But does it really when we look at a â€real lifeâ€ scenario? Take an average first time homebuyer who purchases a $175,000 home with 3% down at a 4% interest rate with 4% appreciation per year ( a very realistic number in the valley).Â In five years, that borrower has a net equity of almost $50,000.Â To see this example click here. Still wondering why to buy vs. rent?Â The answer is all in the numbers!